President John Adams nominated John Marshall to be Secretary of State on May 12, 1800, the same day that Adams dismissed Timothy Pickering. The U.S. Senate confirmed Marshall as Secretary of State the next day. He served as Secretary of State from June 6, 1800, until February 4, 1801, and then as ad interim Secretary of State until March 4, 1801. Marshall was raised on the Virginia frontier. He fought in the Revolutionary War, serving as a Captain in the Continental Army. He studied law at the College of William & Mary and gained admission to the bar in 1780. A lifetime of public service commenced with his first electoral victory as a delegate to the Virginia General Assembly in 1782. Marshall served as a member of the Assembly until 1791 and again from 1795 to 1797. He gained a seat on the State Executive Council from 1782 to 1784 and was an influential member of the Virginia Convention of 1788, which ratified the U.S. Constitution. Marshall emerged as the Federalist Party leader in Virginia and gained election as a U.S. Representative in 1798. While serving as Secretary of State near the end of Adams’ presidential term, Marshall received a nomination to serve as Chief Justice of the Supreme Court. 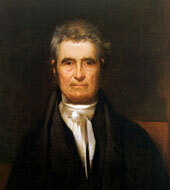 He served as Chief Justice until 1835. Marshall began his diplomatic career as one of the three envoys appointed by President Adams to negotiate with French Foreign Minister Talleyrand in 1797. The mission failed, resulting in the XYZ Affair and the Quasi-War with France. Nonetheless, Marshall’s conduct and reporting about the scandal turned a diplomatic failure into a personal triumph as his reputation soared at home. As Secretary of State, Marshall was less partisan and more loyal to President Adams than Pickering had been. Adams entrusted Marshall with considerable authority over foreign affairs, particularly so after Adams departed the newly established national capital at Washington for an eight-month stay in Massachusetts. Marshall’s deference to Adams further defined the position of the Secretary of State as a political subordinate of the President rather than the independent office that Pickering had imagined. Secretary Marshall reasserted a policy of nonalignment regarding the European powers during a critical period. He split with other Federalists, such as Alexander Hamilton, and supported ongoing efforts to negotiate with France following the humiliating XYZ Affair. He backed the Convention of 1800 between the United States and France, which finally ended the undeclared naval war between the two countries. In dealing with Britain, Marshall protested the British Navy’s unlawful seizure of U.S. shipping and impressment of U.S. seaman as well as the British courts’ tolerance of piracy against U.S. merchant vessels. Recognizing the limitations of U.S. naval power, Marshall begrudgingly approved ongoing payments to the Barbary pirates who continued to raid U.S. merchant vessels. He also experienced frustration when negotiating with the Spanish who disregarded U.S. neutrality rights and protested against U.S. support for anti-colonial uprisings in Spanish America.